So perhaps you've signed up for an Introduction to Nose Work class, and perhaps you've even read why great Nose Work treats have just the right taste, size, and integrity -- and that the stink and slime factors matter too. There are so many great dog treats produced today. Which ones will be the most successful great Nose Work treats, for your Introduction to Nose Work class? Choovio Beef & Mussels; Choovio Chicken & Mussels, and Choovio Turkey & Mussels. You would expect treats containing mussels to give off lots of odor, and these do not disappoint. At the same time, the odor is not too offensive to most people, and these treats are not even a little bit slimy. They can be broken into pieces of any size without crumbling, making them a great Nose Work treat for dogs of all sizes, from giant to tiny. These treats have ALL of the qualities of great Nose Work treats. They're stinky, not messy, and can easily be broken into any-sized pieces without becoming crumbs. Dogs LOVE these treats! Etta Says! Sliders come in both lamb and beef, and are perfect great Nose Work treats. Dogs go crazy for these Bixbi salmon treats. Plus they have a wonderfully strong aroma. These Bixbi Bacon Pocket Trainers are a great size -- and can also easily be broken in half. Dogs love them! Most dogs are gaga for Plato Salmon Strips. Plato also makes Duck Strips and Chicken Strips. Fruitables Jerky comes in many flavors. They are easily broken into smaller bits and are well-loved by the dogs. We recommend the all-meat flavors of Fruitables Jerky, for Nose Work. Pill Pockets: Not just for pills any more. Pill Pockets® are stinky, and our dogs find them enticing and delicious. They're a nice size, but also easy to split into halves or smaller pieces. They're quite malleable and won't fall apart. Beyond a little odor left behind on your hands, they're not too messy either. These treats truly reek. You may wish to use gloves to keep the intense scent off your fingers. Your dog will go bonkers for these. It can be a challenge to give the smaller dogs the high rate of reinforcement desired for Introduction to Nose Work, while keeping their weight and diet under control. In addition to the fact that dogs love them, these treats are easy to handle on the human end, plus, not messy at all. These great Nose Work treats are stinky, not messy, and can easily be broken into tiny pieces without becoming crumbs. Dogs LOVE these treats! These sticks can be broken into tiny pieces for the smaller dogs. And dogs LOVE these California-sourced healthy treats! Store-bought treats are all well and good, but there are several advantages to home-made treats. They are often (but not always) tastier and cheaper, and the variety is almost limitless. However, they are often more work than store-bought treats. You can get fancy, or you can get by with just a knife and a little imagination. Is that a salami in your pocket? Thin-sliced salami. Our Labradors' favorite Nose Work treat. We've recently discovered salami as a very high value Nose Work reward. It's stinky. It's greasy. 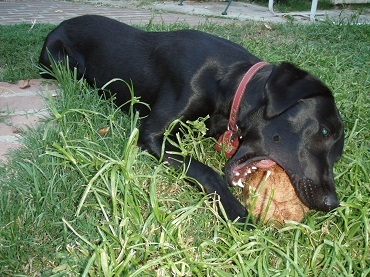 Our Labradors LOVE LOVE LOVE it. You could buy a big stick of salami, but we suggest spending a little extra and buy it already sliced. (We further tear each slice into 3-4 smaller pieces.) Sliced is easier for the handler, and there's another big advantage: the thin slices cover a larger portion of the dog's tongue, compared to chunkier treats of similar weight. This gives your dog the illusion that it's a larger treat than it really is. Hot dogs are easily the most popular Intro to Nose Work reward. No, not that kind of hot dog. Hot dogs slice easily into bite-sized pieces. They are easy (they're pre-cooked), convenient (you can chop and freeze them), available everywhere, cheap, and have a distinct odor and taste that dogs love. The best ones hot dogs for Intro to Nose Work are pork and/or beef, with a high fat content. Cheese is another easy favorite. If you're lazy like us, you can buy it sliced or diced, or in single-packet servings. Or you can save a little money and chop it yourself, before you come to class. For the best Intro to Nose Work results, go for stronger cheeses (be reasonable: no stinking out your classmates or instructor please). Sharp cheddar rather than mild. Swiss rather than Monterey Jack. You get the idea. And avoid soft, cream-cheese consistency; if you can spread it with a knife, it will also stick to the boxes, and to your fingers. I'll have what he's having. Do you have meaty left-overs? Wash off any sauce, dice it, package it, and you're ready for Nose Work class. If you're lucky enough to have a friend in the restaurant business, politely ask if you can get unfinished meat portions after the plates are cleared. You never know, you just might have a pipeline to almost unlimited left-over steak! If you are willing to spend more time and money, you can cook and dice cuts of beef, lamb, turkey, or chicken. Note: Please don't bring raw meat to class. Humans will be handling the food, and we can't assure the safety of humans handling raw meat. Just as with kids, dogs love fast food burgers (just the burger, no bun or toppings) and fries. Fast food corporations invest heavily into developing just the right combination of flavorings, fat, and sugar to entice young palates. Yes, it's far from a complete or healthy diet. It's up to you, whether you're okay with these items as special treats. Dehydrator: is it worth the money? Some people swear by a dehydrator for home-prepared treats. A cheap alternative, and the one we use, is to spread the treats on a baking tray, turn your oven to the lowest setting, and bake for an hour or two. The dehydrator is easier, usually can be preset to turn itself off, and provides a more appropriate heat level for the very best outcome. The oven is cheaper and you already have one in your kitchen, but if you leave the treats in too long, they will burn. Not that we would ever do that here. Or set off the smoke alarm. Cough cough. Why dehydrate? If you take out some of the moisture, you decrease the slime factor, and increase the shelf life. Don't take it too far though. Over-dried treats lose that stinky quality that will keep your dog searching for more. Home-Made Tuna Treats. The home made tuna treats have been tested and approved. Our dogs go bonkers over them. See the recipe here. Home-Made Chicken Treats. The fabulous Eileen Anderson shares a revolutionary way to make treats that don't require chopping. See her secret here. I can't wait to try it on our beta testers! Secret recipes. We really don't have a secret recipe. Truthfully we don't try many; we're too busy baking desserts for ourselves instead. But many people do cook up Nose Work treats from recipes. Have you baked treats for your dogs? What did you think? Would you be willing to share your favorite recipes, for the benefit of all Nose Work dogs? In choosing great Nose Work treats, make sure you look at the ingredients to determine if they are appropriate for your dog. Check for items that may cause any allergic or digestive issues for your dog. Safety and health always come first. Have you discovered great Nose Work treats? What have been your most successful Nose Work treats? How do they rate on the scale for taste, integrity, odor, slime, and size? 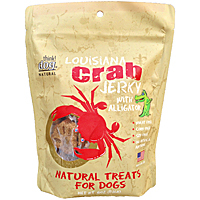 Have you found any treats that reek more than Louisiana Crab Jerky? Do you have a favorite "real food" for Introduction to Nose Work class? Our Labradors are eager to try out your treat suggestions.